The excavation in Area H, which was a continuation of a trench begun two years earlier, proved very fruitful. 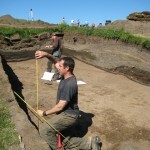 It was from this trench that the majority of bones and artifacts were recovered. As the season began we had hoped to complete this area, getting down through all of the cultural deposits and exposing the natural substrate. 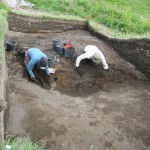 However, due to the large quantity of material recovered each day, it was slow going. 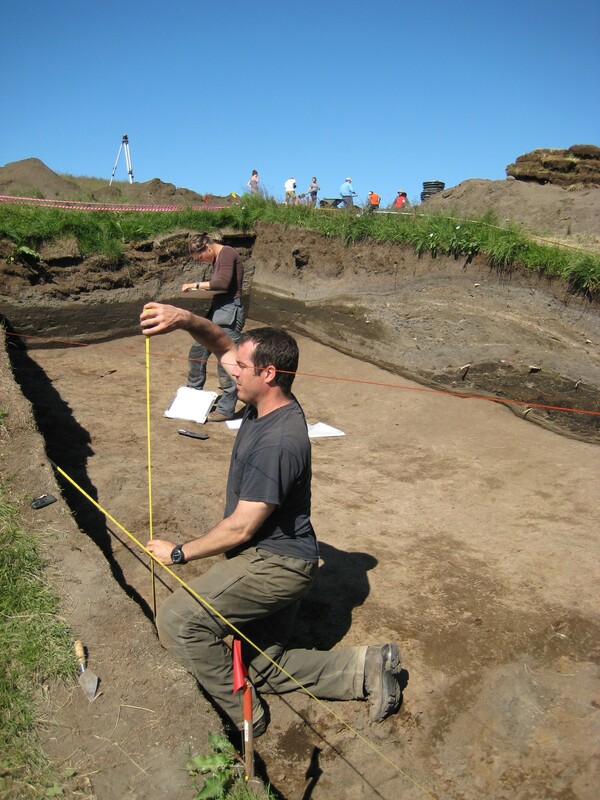 I guess archaeology is kind of like baseball, the more exciting it is the longer it gets drawn out, unless an old-fashioned pitcher’s dual is what excites you, but I digress. Anyway, we ended up stopping at the 1477 tephra layer, and will pick up from here next season. Yes that’s right, we are definitely coming back for one more year of work at Skutustaðir, thank you NSF (and Uncle Obama!). 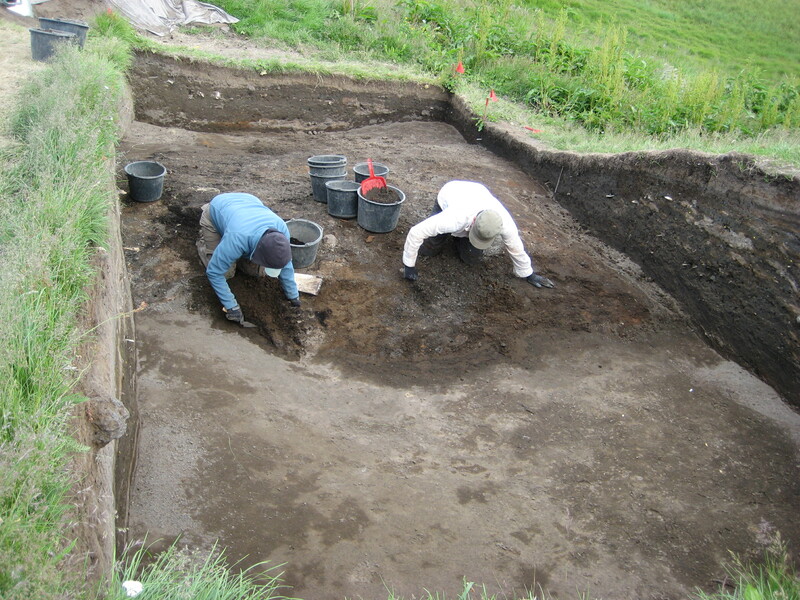 Most of the material recovered this season came from the 16th and 17th centuries, including the artifacts shown in an earlier post. While the work was slowed by having to record so many bags of bones and artifacts, the midden stratigraphy itself was as expected, ie no surprise structures here. Amanda, George, and Seth in Area H. The flies thought Seth was especially tasty this day. Area H represents the location of intense trash dumping from centuries ago. 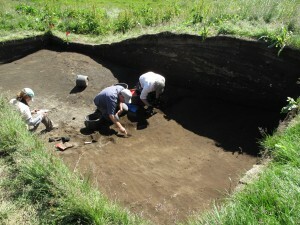 While excavating these deposits the archaeologists can often discern very discrete episodes of dumping, sometimes being able to identify deposits that represent one particular night’s leftovers being thrown out. However, as careful as we might like to record these accumulation events we must also be practical, especially considering the time limitations we have on site. In the end we must make decisions that lead to lumping together many discrete events, so long as they are relatively close chronologically. 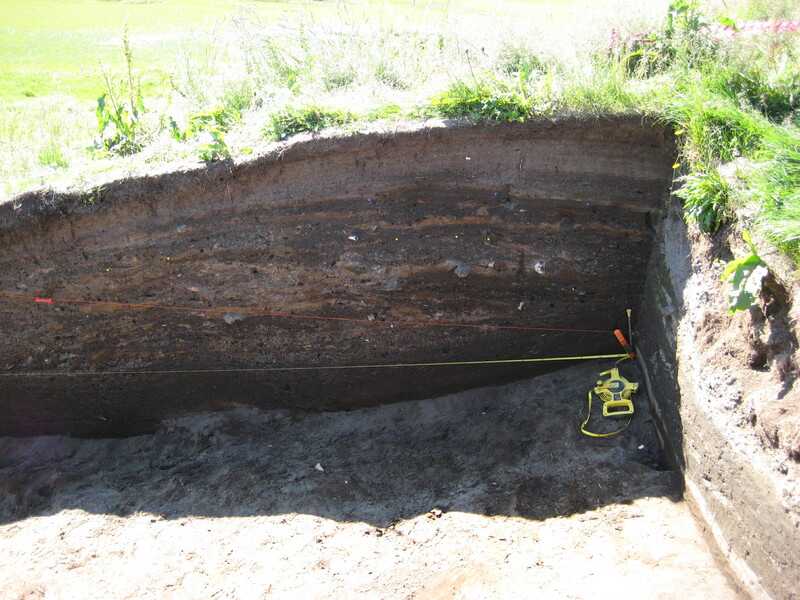 This is yet another way that the tephra layers become useful, as temporal markers that allow us to divide up the these ancient events and still allow for accurate stratigraphic control. Drawing the north facing section of Area H.
location. One would assume that the ideal farm location would be in a particularly fertile place, where grazing fields are as close as possible to the farmhouse. But perhaps there are more considerations in play than one would initially think of. 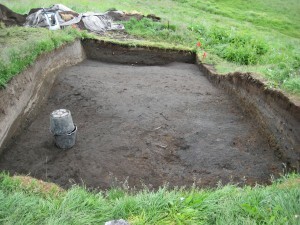 The location of Skutustaðir does have other advantages, being close to the lake with its numerous resources and sitting on top of a hill with a good view in all directions. Also, maybe if you are going to build a farm on an island where fertile grassland is rather limited, the ideal place for the actual structures is a location that is not fertile at all, and therefore not taking away from grazing areas. These are just a few general questions being considered as we have been working at Skutustaðir and other farms in the region. make such an effort to refill the trench, only creating that much more work for ourselves next year. However, the trench is located in someone’s backyard, and as a courtesy to her it was necessary to leave as minimal a trace as possible. That’s it for now. A few more things to say about Skutustaðir to come and then it’s on to video editing and prepping for Barbuda in the Spring. Side note: I just discovered that if you click on the pictures you will get the full-sized version. I told you I was new to this whole blogging thing. Learning something every day.